Latest News: Applied candidates now can apply till 19th March 2019 (6 p.m.). UPSC has extended it by 1 day. Short Info:- The department, Union Public Service Commission (UPSC) has notified all by releasing the official notification regarding the UPSC IFS & IAS Preliminary Online Form 2019. The department is considered to be of the best department to work in India as it holds the Administrative powers in our country. This recruitment is for the UPSC IAS, IFS Pre Examination 2019. A large number of applicants are noticed to prepare for the UPSC IFS & IAS Preliminary Examination 2019. Its craze has never gone down among the participants. So, the candidates who think they deserve the badge of IFS & IAS Officer can apply for the UPSC IFS & IAS Preliminary Examination 2019. 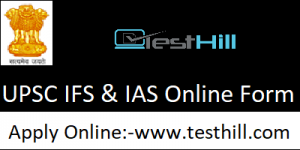 The application for the UPSC IFS & IAS Preliminary Online Form 2019 has started on 19 February 2019 and it will be going on till the 18 March 2019. Candidates are suggested to take a look on the UPSC Official Notification, where they could find out whether they are eligible or not. The department has decided to conduct the UPSC IFS & IAS Preliminary Examination 2019 on 2 June 2019. All information regarding the following UPSC Online Form 2019 is available on the official website i.e. www.upsc.gov.in. IFS – Candidates having Bachelor Degree in any one of the Subjects:- Animal Husbandry & Veterinary Science, Chemistry, Geology, Physics, Botany, Zoology, Statistics, Agriculture in any stream from any recognized University/ Institute will be considered for this Examination. The applicants can now be able to apply for the UPSC IFS & IAS Preliminary Examination 2019. They need to visit the official website to check their eligibility for the declared post. Candidates Age, educational qualification are the main criteria which have to be clear prior to applying for the UPSC IFS & IAS Preliminary Examination 2019. Also, they are advised to apply for UPSC IFS & IAS Preliminary Examination 2019 before the last date i.e. 18 March 2019. The application portal will be closed after the due date. The credentials are given while making the UPSC Online Form 2019 have to be accurately filled as the department is very strict about the documentation. There is no room for any mistake ones the submission. Tentative dates are given on the official website and on this article as well. All participants are advised to be aware of such important dates.